Last month, during the Society for Humanistic Psychology Conference at Sofia University, I had the honor of attending a presentation by Elizabeth Wolfson centering on creativity in midlife. Toward the beginning of her talk, Elizabeth posed the question, “What is nostalgia?” I responded with the first and truest answer that bubbled right up out of my bodily felt sense. “Homesickness,” I said. She paused, looked right at me, tears glazing her eyes, and told me, “Wow. That really touched me.” I, too, was touched by that I-Thou moment of connection, feeling for the space of a few seconds every bit of that very thing—homesickness, longing. I associate this feeling with a desire to be connected at increasingly greater depths with something that seemed to come so easily as a child, something I can only describe here now in midlife as magic, mystery, and wonder. I knew, also, that Elizabeth was experiencing something very similar in that moment, though perhaps her vocabulary differs from my own. As a child, I had no need to think about or reflect on my connection with the natural world, or to consider at any length my place in it. 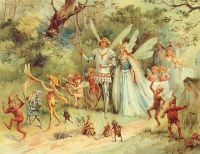 Faeries and nature spirits were my playmates, and I was of their company. I organically accepted the animism of my world; miracles were almost commonplace. I could tell many stories here, but perhaps this one brief account will suffice. I have a vivid memory of being six years old and climbing a corkscrew willow tree in our side yard. I managed to climb to the very top of the tree, about 50 feet up, where the limbs were thin and not sufficient to hold my weight. Inevitably, the branch on which I sat snapped, and I fell all the way to the ground. I landed in a sitting position, somehow uninjured. My body memory even now insists that the turf on which I landed felt like pillows. Alas, whatever capricious nature spirits intervened to soften my landing were nowhere to be found about four months later, when I fell off a driveway wall and needed three stiches in my chin. Initially a spontaneous response at a conference, my choice to use the term “homesickness” to describe nostalgia in midlife is now very deliberate. I am not endeavoring to be simply metaphorical or poetic. To me, the word most fully encompasses my whole body desire to return to some primal, organic, unsullied, pristine state of union or connectedness. Nor is it adequate to say that it is only a Freudian desire to crawl back into the womb. It is not solely a yearning to be whole; it is also a striving to somehow remember when I was a resident of that first place—of which this beautiful world that we are despoiling is but a pale reflection. To say that it is a mystical and spiritual longing is a true statement, but one that reducibly falls short of the numinous, mysterious actuality of the lived experience, with full presence in the moment. I feel that this homesickness lives and moves in many of us at this midpoint in our lives—or perhaps at ANY transitional juncture during which we might experience an occasional sense of psychospiritual infertility or staleness. Concepts like “emptiness,” “vacuum,” or “meaninglessness” may also apply. Awareness of homesickness reveals to us the state of disconnection in which we find ourselves. It stirs a restlessness that wakes us out of sleep. It drives many of us to make significant life changes—to take wise or foolish risks—as we wander into Campbellian heroic adventures, attempting to reconnect with what feels authentic. Some of these might even produce lush prizes and stories for posterity through our explorations. Others of us seemingly lose our grasp on our hard-won impulse control, becoming lost in addictions. We may then engage in a futile attempt to ward off the encroaching and despairing realization that we feel unable to recapture any sense of the magic that we associate with youth, but which derives, in fact, from that much deeper spiritual well described earlier. Here again, reductive terms like “midlife crisis” fail utterly to capture the creativity and complexity of what is actually happening. Occasionally, we may quite serendipitously and deeply encounter each other on our own journeys home, inspiring and encouraging each other, feeling as a result a little less lost and disconnected. We may also deliberately cultivate comfort in groups, families, tribes, and communities, where we support each other with intent and compassion on our respective paths. The title of this article derives from a quote attributed to Ram Dass: “We’re all just walking each other home.” I felt that the quote captures perfectly both the sense of spiritual homesickness as well as the ways in which we find and love each other along the way. By way of conclusion, I feel like I would be remiss if I did not at least briefly consider just a bit more deeply the role of aging in connection with homesickness. As I was working out at the gym last week, I was reflecting on how important my continued health and fitness in middle age has become to me. I work so hard to preserve grace and mobility, and recapturing some of my youthful vitality has been a joy. Yet, I also feel in every muscle and joint the onset of age—particularly during workouts! Reveling in the post-workout endorphin rush, I had a thought. The deterioration of my physical body and loss of youthfulness in aging may not at this point be contributing significantly to my alienation from Home after all. As a child, I certainly embodied connection with Home in my very beingness. My body naturally connected me to it. Yet, I was also not as able to experience and appreciate spirituality and mysticism in the way I do now as an adult. What if I am encountering less need for a physical body as I age, and am simply preparing to discard it as an increasingly unnecessary crust or shell that only serves to shield me and separate me from the brightness of mystery that awaits me upon my return Home? I feel—and I hope—that the day I no longer need that shell at all is still far off. I am very much still enjoying my embodied experience of this life and the connections with dear friends and family it enables for me. Yet perhaps I no longer feel the need to take high magnitude risks in service of my heart’s desire. Where once I gambled everything for love (as Rumi says) and benefitted greatly thereby, perhaps now I am finally ready to embrace the rest of my life in its totality. Perhaps I can accept with greater serenity my body’s natural preparation for my ultimate return Home. My nostalgia and longing thus help me embrace my life—all of it—at ever greater depths.